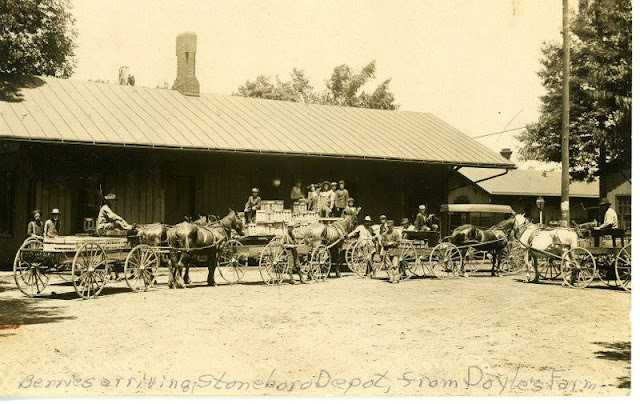 That banner week that ended Saturday, June 13, 1908, 600 bushels of strawberries were harvested at Doyle's Strawberry Farm in Stoneboro, Pa. At that time the owner of the farm was William Doyle, my great-grandfather, known to family as Pap. Gust, my paternal grandfather and William's son, is the young man standing third from the right in the above photo. The lady standing to the right of Gust (from our view) looks like his mother, Tressa (Froman) Doyle. I believe William (short with a big mustache) is the man standing fifth from the left with the dark hat. The man wearing a suit, white shirt, and bow tie was the "berry man," the one who made arrangements for transportation of the berries. If you look closely you can see several carrier baskets with quarts of strawberries. The man at right is sitting on what appears to be a nearly empty crate of quart strawberry baskets. Another crate is beside it and empty crates are piled on the far left of the photo. I've known for years that Dad's family had a strawberry "patch" but only upon finding this postcard did I realize what a misnomer the word "patch" is. Strawberry farm is more accurate. The berries were recorded in bushels but were clearly neither collected nor transported in bushel baskets. I try to imagine 600 bushels of strawberries, but can't quite. Research tells me that one bushel of strawberries equals 32 quarts and 48 pounds. Calculated further, 600 bushels of strawberries equals 19,200 quarts or 28,800 pounds. Research did not help me find how many acres might have been needed to produce 600 pounds in one week. My father's half-sister wrote that during Gust's stewardship of the farm there were two acres devoted to berries. 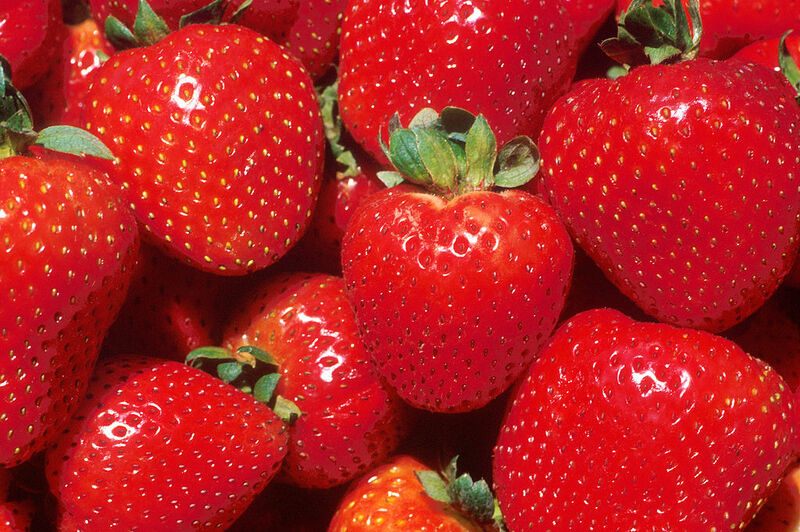 Could two acres produce 600 bushels of strawberries in one week? Or were more acres planted with berries when William was the farm's owner? It's hard to know how much income the berries brought to the Doyle family. A great-aunt recalled payment of 1¢ per quart (worth about 27¢ now) for picking berries at about the time of these photographs. Another aunt recorded that during her father Gust's time as the primary farmer, 25 years after this photo, berry pickers were also paid 1¢ per quart. After picking, the berries were transported by horse-pulled wagons to the train depot. This photo shows "Berries arriving Stoneboro Depot, from Doyle's Farm." Imagine transporting strawberries in June, 1908, at the slow speed of a train and without refrigeration. How fresh could they have been upon arrival, even to Franklin, less than 20 miles away? I gleaned a little more information about the farm from an article in a Stoneboro Anniversary pamphlet my mother saved. The article was published in Sandy Lake, Pennsylvania, in 1962, but I don't have any publication information. Strawberry Time In Stoneboro -- Remember? 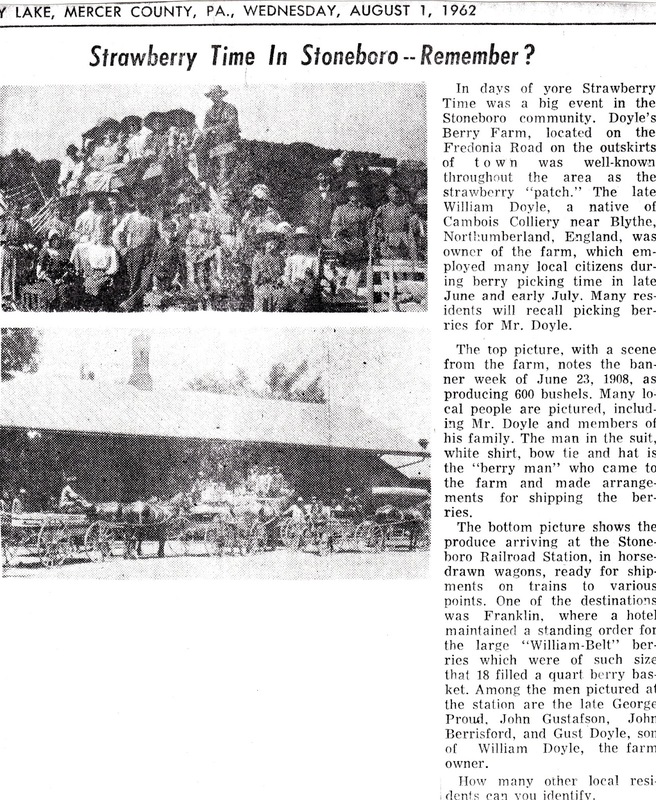 In days of yore Strawberry Time was a big event in the Stoneboro community. Doyle's Berry Farm, located on the Fredonia Road on the outskirts of town was well-known throughout the area as the strawberry "patch." The late William Doyle, a native of Cambois Colliery near Blythe, Northumberland, England, was owner of the farm, which employed many local citizens during berry picking time in late June and early July. Many residents will recall picking berries for Mr. Doyle. The top picture, with a scene from the farm, notes the banner week of June 23, 1908, as producing 600 bushels. Many local people are pictured, including Mr. Doyle and members of his family. 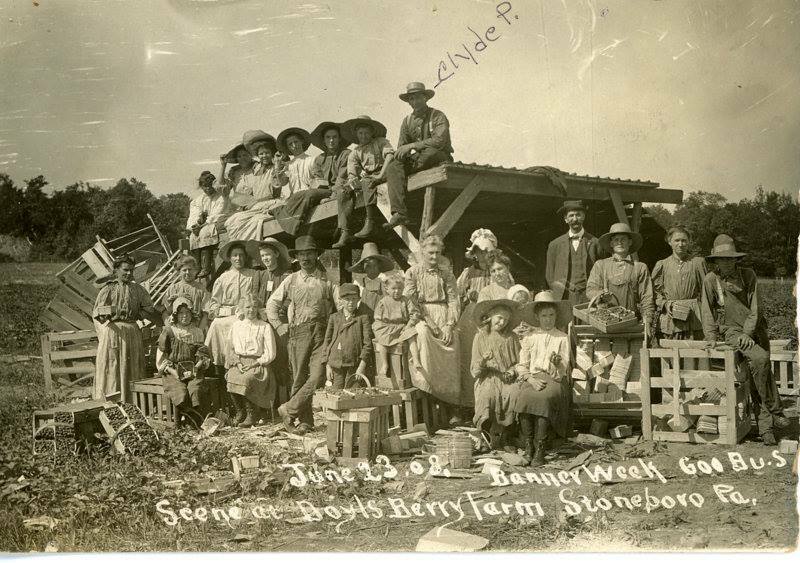 The man in the suit, white shirt, bow tie and hat is the "berry man" who came to the farm and made arrangements for shipping the berries. Both sepia photographs in this post were published by Bob Cowan on facebook in a collection of "38 Stoneboro photographs" with the note, "Photos scanned from my friend Lyda for your use and enjoyment." (Click right and left arrows on facebook screen to see all Stoneboro photos.) Lyda and I are cousins: her grandmother, Liz Jane Doyle, and my great-grandfather, William Doyle, are siblings. Thank you, Bob Cowan, for scanning and sharing Lyda's photos. Strawberry season is nearly at its end in Ohio this season and I haven't picked a single berry. I think I'll forego the picking and just eat them this year. Whenever I eat strawberries I always think of my ancestors' Doyle Strawberry Farm. Great photos of the strawberry patch & train depot. It is hard to image that many berries. I love all the wide brimmed hats to keep out the sun as they picked. Now I want toast & strawberry jam! Thanks, Colleen. Oh, yes, those wide-brimmed hats would have been necessary in 1908 when women were still trying to prevent freckles and sunburn, but I notice some of the men were wearing them, too. I also see a few sunbonnets in the first photo.